CONVERSABLE ECONOMIST: Are U.S. Labor Markets Becoming Less Fluid? A fluid labor market can offer considerable protection for workers, in the sense that if you don't like your current employer, or your current employer lays you off, you have the ability to get another job. When the labor market is less fluid, getting jobs is harder (especially for new entrants) and negotiating for better compensation is trickier (because everyone knows that other job options may be hard to find). Steven J. Davis and John Haltiwanger offer evidence that the fluidity of the U.S. labor market has been decreasing for several decades in their paper "Labor Market Fluidity and Economic Performance." A version of the paper was originally presented last August at the annual Jackson Hole conference held by the Federal Reserve Bank of Kansas City. I'll quote here from a November 26, 2014 version of the paper posted at the KC Fed website. However, a version of the paper is also available as National Bureau of Economic Research Working Paper No. 20479, issued in September 2014. As a starting point, considers some evidence on job flows. 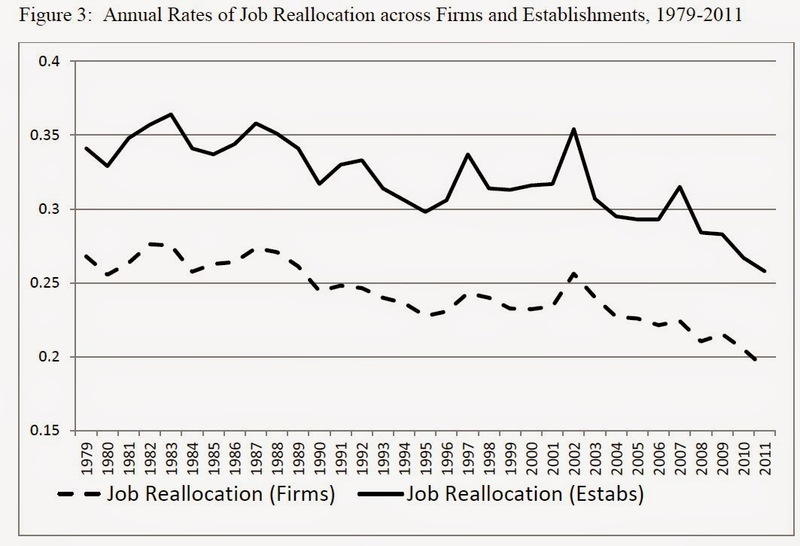 As Davis and Haltiwanger explain: "Job creation is the sum of employment gains at new and expanding establishments, and job destruction is the sum of employment losses at exiting and shrinking establishments." Here's the quarterly pattern of job creation and hires since 1990. 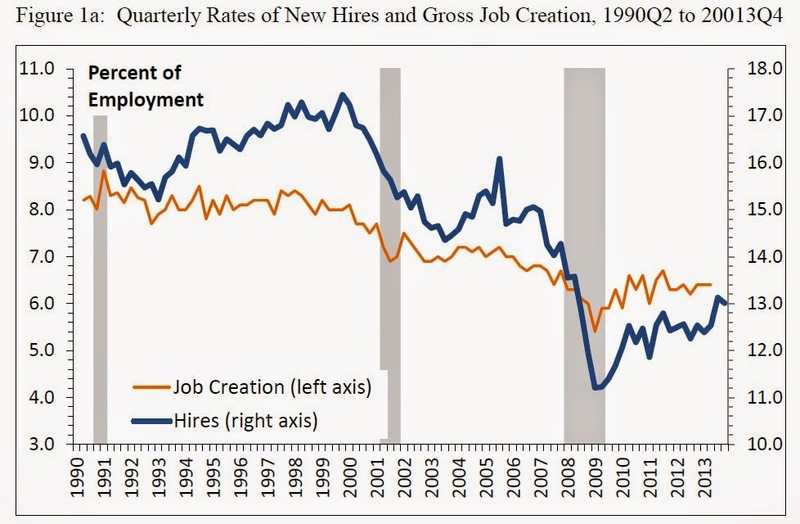 Hires is greater than job creation (notice that the right-hand and left-hand axis are measured differently), because when (for example) workers at two different companies switch jobs, both companies have hired someone, but there is no overall job creation at either firm. Notice that the rate of job creation has been sagging since the 1990s, well before the Great Recession. 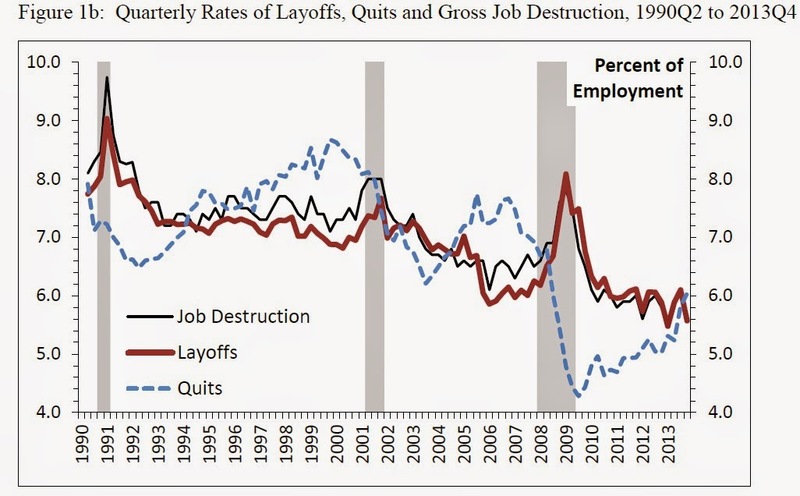 Here's the quarterly pattern of job destruction since 1990, where teh overall level of job destruction includes both layoffs initiated by the firm and quits initiated by workers themselves. The data moves around a lot in recessions--for example, you can see the rise in layoffs and drop in quits during the Great Recession around 2008-2009--but since 1990, there is also a gradual decline in rates of job destruction. "Long-term declines in job and worker reallocation rates hold across states, industries, and demographic groups defined by gender, education and age. Fluidity declines are large for most groups, and they are enormous for younger and less educated workers." 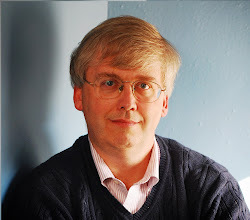 Many factors contributed to reduced fluidity: a shift to older firms and establishments, an aging workforce, the transformation of business models and supply chains (as in the retail sector), the impact of the information revolution on hiring practices, and several policy-related developments. Occupational labor supply restrictions, exceptions to the employment-at-will doctrine, the establishment of protected worker classes, and “job lock” associated with employer-provided health insurance are among the policy factors that suppress labor market fluidity. As yet, however, we know little about how much these policy factors contributed to secular declines in fluidity." "The loss of labor market fluidity suggests the U.S. economy became less dynamic and responsive in recent decades. Direct evidence confirms that U.S. employers became less responsive to shocks in recent decades, not that employer-level shocks became less variable. ... Since 2000, job reallocation and the employment share of young firms have declined sharply in high-tech industries. These developments raise concerns about productivity growth, which has close links to creative destruction and factor reallocation in prominent theories of innovation and growth and in many empirical studies." "If our assessment of how labor market fluidity affects employment is approximately correct, then the U.S. economy faced serious impediments to high employment rates well before the Great Recession. Moreover, if our assessment is correct, the United States is unlikely to return to sustained high employment rates without restoring labor market fluidity." I'll only add that the decline in labor market fluidity isn't a result of any one factor, and some of the economic and demographic forces behind the decline may be unavoidable or desireable. But the decline is also worrisome for the long-term health of the U.S. labor market and economy. When discussing policies that affect labor markets, whether they contribute to the ongong decline in fluidity should be part of the conversation.